Destiny 2 is taking players to some pretty awesome places around our solar system, and outside of it, but I’m not sure we’ve managed to see the full scale of what’s on offer in said planets. 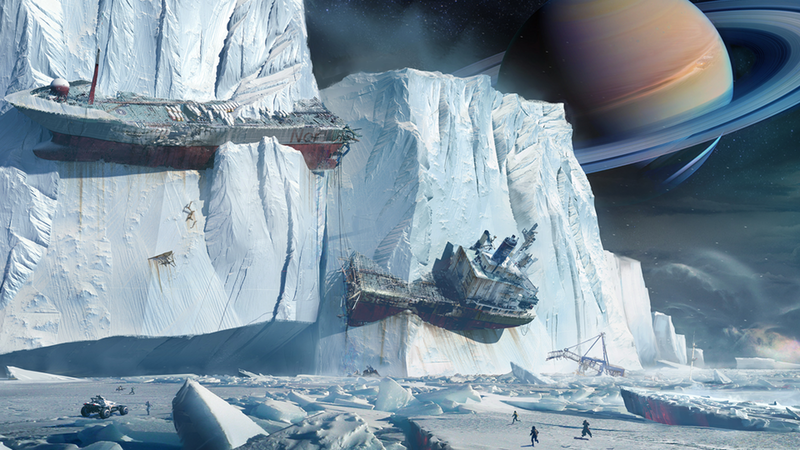 The concept artists at Bungie must have had dozens of ideas about where they wanted to take fans out there, but even the few places they’ve chosen have been given a Destiny makeover to change them into something that expands the universe of the games, and doesn’t simply add some extra planets. Titan is a great example of a planet, well moon technically, that Bunige have taken and and given their own spin in order to expand the universe of Destiny, as well as humanity. This moon of Saturn has an atmosphere that has kept its surface an unknown entity for some time, but thanks to images from the Cassini mission we know that the surface is mostly rock and ice water with lakes of liquid hydrocarbons. This basically equates to an incredibly cold place where it’s possible for elements that exist as gasses on Earth to exist as liquids. Not only this but there are lakes as large as seas at the poles, and this is where humanity has made a foothold on one of the coldest places in our solar system. Here we can see ships, as in boats, that have become frozen in Titan’s icy surface. This would seem to indicate that at one point humanity managed to make Titan warm enough for this ice to melt, making it possible to sail across those seas. However, clearly when the Darkness arrived in our system it reversed this process. What exactly was going on here to make the ice melt? Whatever process it was it has now been stopped, leaving the moon in a permanent state of destruction, a living memory of the time the Darkness arrived. In this piece of concept art we can see what looks like one of the poles of Titan. There the seas are constant, so it’s possible that the sight here is still there in Destiny 2. What the massive base is I can’t say, but it looks like a kind of port, maybe where a number of resources from around the moon are being brought to before off-world transport. 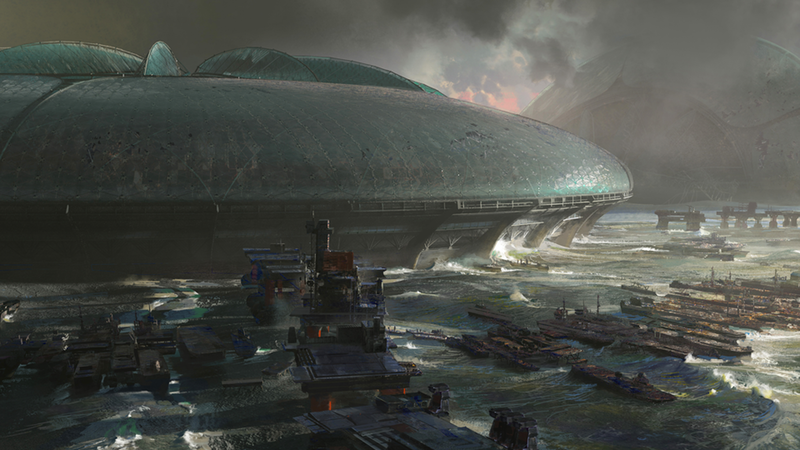 I’m really interested in what was going on with this moon during the Golden Age, and I hope that the lore in Destiny 2 explains more of what this awesome concept art shows.